I have heard it said that injuries are the most common within one mile of the home. It makes sense; I suppose we spend the majority of our time there. But it seems to fly in the face of Murphy's Law: anything that can go wrong, will go wrong. More specifically for Mark and I: the farther from home, the greater the chance of injury. We've actually been pretty lucky injury-wise, but it's the near misses that are enough to make the hairs stand on end. 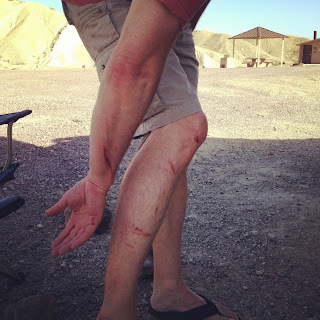 One of the last trips we made to Death Valley (bad back flare up to the indispensable Mark) scared me enough to sign up for a Wilderness First Aid Training course just to brush up on my ancient first aid knowledge. 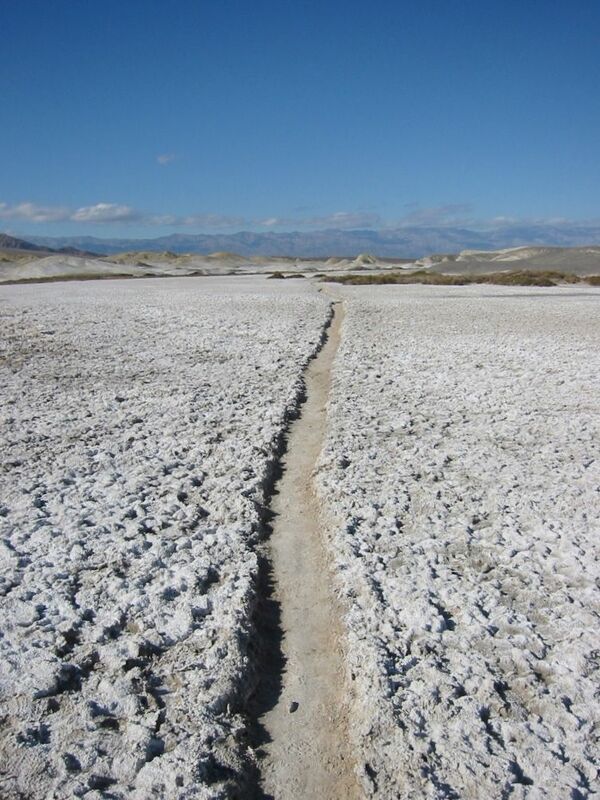 Hiking in Death Valley requires gobs of sunscreen and gallons of water. When you think about injuries during a hike the big gory ones come to mind first: falling off cliffs, bear attacks, snake bites, avalanches--all threats that could end your life in an instant. In my experience it's more often the little things that start to snowball. I can't tell you how many times we've taken off on a trail "just to see where it goes" and come back hours later, dehydrated and hungry because we hadn't started out with the intention of doing a long hike. The trailhead was just there, and wouldn't it be cool to see where it goes? And whoa, this is pretty, let's just see what's around the corner... No water, no food, no extra clothing in case of a weather change. Stupid. Go climb a rock, they said. Dehydration is no joke. And it seems unnecessary to mention, but if you do remember to pack it along, don't forget to drink it. 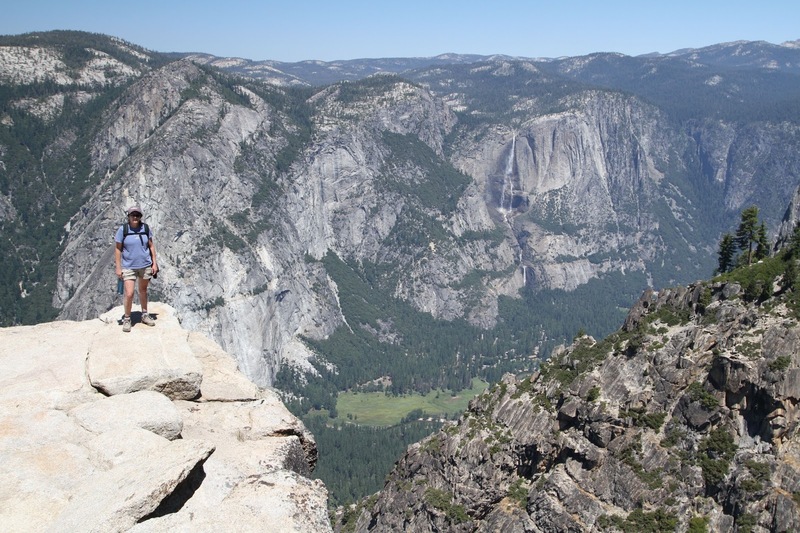 I'm embarrassed to tell you this, but on my first big hike in Yosemite I made some poor decisions that ended with me collapsing at the end. 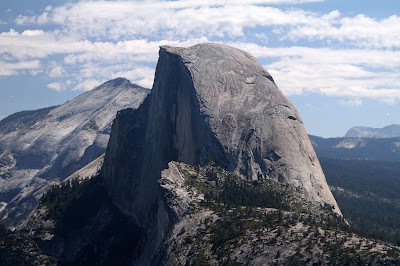 I really wanted to hike to Half Dome--it's the one you have to finish if you want to call yourself a Yosemite hiker--and I had trained for months. We loaded up on snacks and water and set off on the trail early in the morning. We made it to the top around noon, stopping long enough to admire the view and take a few pictures after eating lunch from our perch on the dome. We made our way back down pretty quickly, and as we got more and more tired we got more and more impatient with the crowds of people on the trails near Vernal and Nevada falls. We stopped a few times and had a little water, but in the end we just wanted to get back to our campsite, so we rushed down the mountain. At the base of the trail there's a snack bar and I was obsessed with the thought of an icy cold drink after 18 miles of dusty trail. We finally got to the snack bar and of course there was a long line of people waiting for their icy cold cokes. Augh! On our way down we had been worried that it would be closing soon, so we had run the last mile or so to make sure we got there in time. I think the running, then the sudden stopping combined with not drinking enough water got me. One minute I was standing in line, the next thing I knew Mark and some guy I never saw before were propping me up on a bench, asking if I was ok. Fainted dead away. Drink your water folks. Unhappy pinky toe leads to a miserable hike for Mark. Get enough of those and you won't be walking too much farther. If you try to keep going while favoring your other foot, you just might end up with a sore hip or knee from throwing yourself off kilter. That leads to back pain in some people (me), which means you can't really carry your pack anymore, which means (when backpacking) no food, water, tent, sleeping bag...it's a slippery slope. 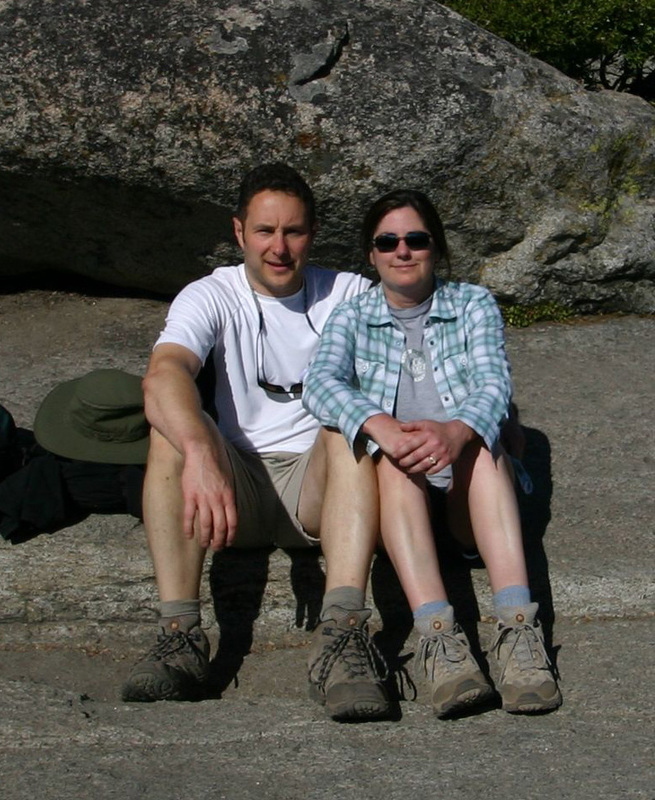 Better to get a good pair of hiking boots properly fitted and broken in and a really good pair of hiking socks. 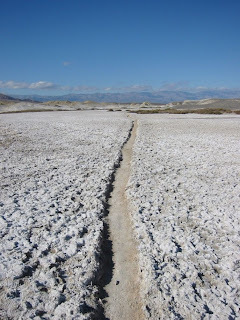 There is no way your partner is going to want to carry his pack, your pack and your sorry self down the trail. It used to be moleskin was the only choice for blister care; it worked pretty well, but boy when you had to take it off you more than likely pulled off some skin with it. Ouch. There's a fairly new product out that is a toe saver. REI carries a BlisterMedic kit (BlisterMedic) that has a two layer system: first a layer of gel padding--it looks like gelatin--then a protective bandage. It really cools the burning and keeps the rubbing to a minimum. I once slipped on a rock and smashed my shin so hard I was convinced it was broken. I rolled up my pant leg slowly, not really wanting to see, and found an egg sized bump had already risen there, with a little blood just for show. Ice isn't plentiful out in the wilderness, so having a small towel or washcloth dipped in cool water really helps the swelling. And of course Advil. The results of playing slip and slide down a gravel hill. Owl Canyon, Mojave Desert. Mark is the king of cuts. Knives, saws, scissors, sharp places on the truck--they have all found him and made him bleed. We always carry a huge first aid kit in the truck with a wide assortment of bandages to cover most any occasion. We have a slightly smaller version that comes along on the trail with us, which we have used many many times. It never fails; you've just gotten settled into your sleeping bag and have managed to almost drift off to sleep, when you hear "zzzzzzzzZZZzzzzzz" Mosquitoes are annoying, and if you're like me, cause big itchy bumps that hang around for days. Deet is the only thing we've ever found that actually keeps them away, but I hate putting it on. It smells like some sort of industrial product that should require personal protective gear to handle. On our Alaskan trip, it actually melted the paint off our camera case because we handled it so often with Deet on our hands. Once bitten though, there's not much you can do about the itching. Benadryl works ok, but only at night. I get really groggy when I take that stuff. There's a solution called Sting-Ease that works for about half an hour--enough time to forget it's itchy and hopefully be distracted enough to not start scratching again. It works on bee stings and other assorted itchy spots too, but the real cure is not to scratch them in the first place. Hard to do. We have cut a few trips short due to injury over the years; twice because of bad backs flaring up. Nothing is as miserable as a pinched nerve in the back. Most everything on the human body is hung off the spine, and when it's acting up, every movement--from lifting to breathing--hurts. The best you can do is try to avoid it in the first place: core exercises and proper lifting. Seems like we all know how to lift properly, but the world just wasn't built with OSHA standards in mind. Try putting on a 60 pound backpack that's laying on the ground "properly" without help. We are prepared for, but haven't yet had to deal with, broken bones, open wounds, heat stroke and eye injuries. Frankly, I don't ever want to deal with them and the fact that we have the kit to help makes me feel better about never needing it. It's that old Murphy's Law again: if you don't have it with you, you'll surely need it. Conversely I figure if we've got it, we'll never have to use it. I know, irrational, but it works for me. 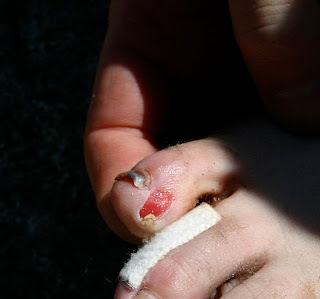 As we get older, I get more worried about something more catastrophic than blisters or cuts happening on the trail. We've taken the 8 hour class that covered the basics of first aid (from Sweet Otter), but I'm now thinking of taking the full certification class to drill in more techniques. There's a certain Catch-22 to aging; we finally have the money, knowledge and equipment to get farther out into the wilderness just as our bodies are starting to whine about going farther out into the wilderness. Youth really is wasted on the young isn't it?